The Frederick man at the center of a family tragedy claimed that he killed his pregnant wife in “a rage” after he realized that she had strangled their two daughters – a shocking twist outlined in court documents made public late Monday afternoon. Watts appeared in court Tuesday for an advisement of those charges. Rourke had declined to answer many questions at a late afternoon news conference announcing the charges, citing the fact the investigation was ongoing. Watts, according to the affidavit, denied it. And Watts told investigators that he had told Shanann Watts that he wanted to separate. He said he walked downstairs for a moment, then returned to talk to Shanann again, according to the affidavit. After returning to the couple’s bedroom, he told police that he looked at a baby monitor he saw Bella “‘sprawled’ out on her bed and blue and Shanann actively strangling Celeste,” a detective wrote in the affidavit. “Chris said he went into a rage and ultimately strangled Shanann to death,” the affidavit said. - Five counts of first-degree murder. Three of the counts allege that he killed his wife and each of his daughters after deliberation. The other two counts allege that he killed each of his daughters, that each was under the age of 12, and that Chris Watts was in a position of trust. - One count of unlawful termination of pregnancy. That count alleges that in killing Shanann Watts he ended her pregnancy. - Three counts of tampering with a deceased human body. At a news conference Monday afternoon, Shanann Watts’ father, Frank Rzucek, offered thanks to Frederick police, the other agencies involved, and people who attended a candlelight vigil outside the family’s home and offered prayers. At the same news conference, Rourke declined to answer many questions – including whether he intended to seek the death penalty in the case. “Way too early to have that conversation,” Rourke said. That decision does not have be made until 63 days after Watts is arraigned. The affidavit outlined the clearest picture yet of the disappearance of the mother and daughters. Shanann Watts returned from a business trip early on Aug. 13, dropped off by a friend just before 2 a.m. at her home in the 2800 block of Saratoga Trail. 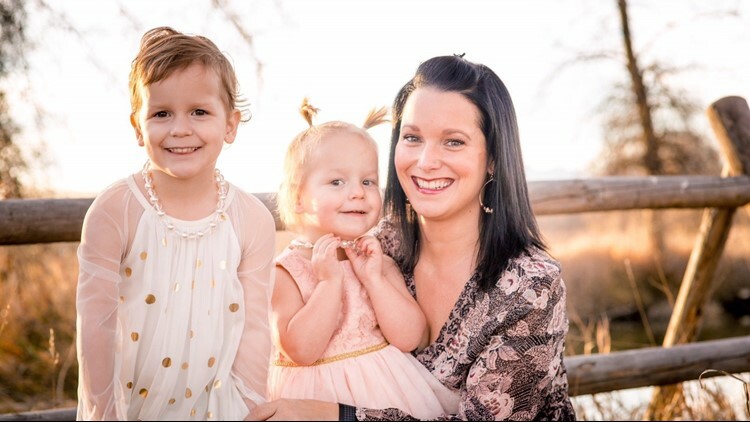 Shanann Watts, who was 15 weeks pregnant and not feeling well on the business trip, and the two girls were reported missing about 12 hours later when that same friend became concerned and went to the family’s home. According to the affidavit, Chris Watts told the officer his wife had come home around 2 a.m., he’d awakened later “and began talking to Shanann about marital separation and informed her he wanted to initiate the separation,” the affidavit said. Watts said that around 5:30 a.m., he backed his truck into the garage to load it with his work tools, then headed off – events captured on a neighbor’s security camera. According to the affidavit, he said Shanann and the girls were in bed when he left. Watts also allegedly told the officer that his wife had told him she and the girls would be going to a friend’s house later in the day. But the officer and detectives who subsequently responded were suspicious of the fact that Shanann Watts’ cell phone, purse, wallet and medication were in the house, according to the affidavit. A detective found that the bed in the master bedroom had been stripped of its bedding – but they found no signs of foul play. Within two days, detectives had concluded that Chris Watts was having an affair, according to the affidavit. That day, Chris Watts asked to speak with his father, according to the affidavit, who was at the Frederick police station, telling detectives he would tell the truth afterward. Following that conversation, according to the affidavit, Chris Watts made the claim that his wife had killed their daughters and that he had subsequently killed her. Then, it said, he loaded the bodies into the back seat of his work truck and took them to an Anadarko petroleum well site a little more than three miles north of Roggen in Weld County. There, he told officers that he buried Shanann Watts and dumped the girls’ bodies into oil tanks, according to the affidavit. A drone search of the area revealed the presence of a bed sheet that matched a pillowcase and another sheet found in a trashcan at the family’s home, according to the affidavit. Investigators recovered the bodies of all three on Thursday. Earlier court filings suggest that defense attorneys may be exploring the story Watts told – they filed motions asking for DNA testing of Shanann Watts’ hands and the necks of the two girls. Rourke, the DA, obviously didn’t give it any credence: Not only did he charge Chris Watts with all three murders, the criminal complaint also suggests the girls may have been killed as early as Aug. 12 – when Shanann Watts was on that business trip and he was home with his daughters.